Posted bymusicjunkiestudios	 January 7, 2017 January 8, 2019 Leave a comment on Month Long Food Drive. Happy New Year!!! I hope everyone had a wonderful holiday season and is off to a great start in 2017. We had such a great holiday season that we’d like to extend it by hosting a month-long food drive to benefit the Tarrant Area Food Bank. Hunger is a bigger struggle in this area than many realize. 1 in 6 people in America face hunger every day. The USDA defines “food insecurity” as the lack of access to provide enough food for all household members at times. In 2011, households with children had a significantly higher food insecurity rate than households without children: 20.6% vs. 12.2%. Currently, 49 million Americans struggle to put food on the table and numbers are predicted to increase over time if something isn’t done. 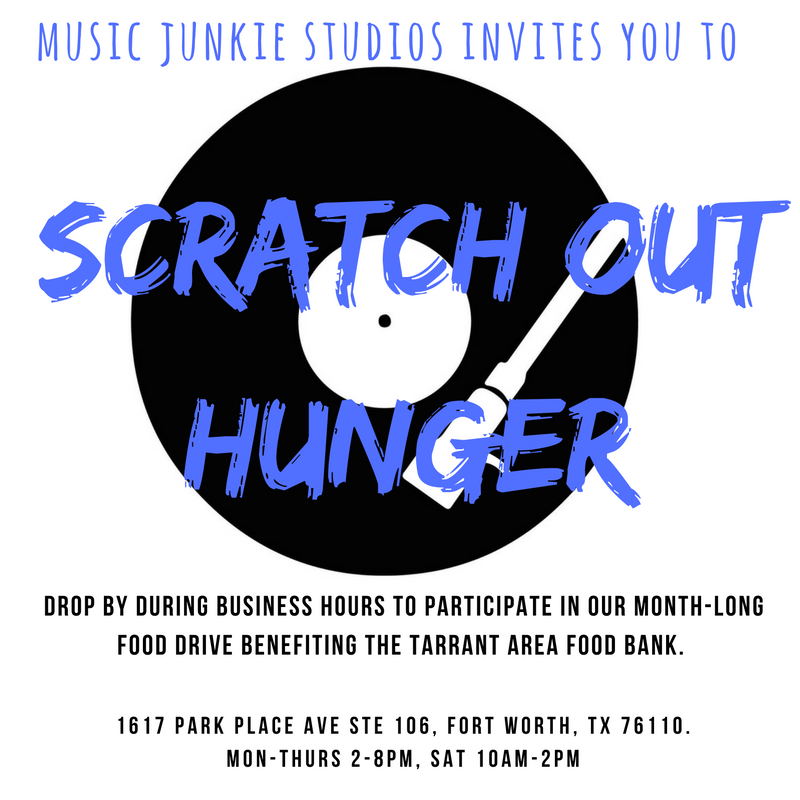 We want to start this year on the right foot by helping the Tarrant Area Food Bank to alleviate the problem locally.We realize we aren’t going to solve this problem over night, but we can make a difference for a time in this community and we’d like to humbly invite you to scratch out hunger with us! Most needed items are protein food such as tuna, canned meat, peanut butter, beans (dry or canned), and beef stew. Other high demand foods are canned fruit, veggies, canned juice, canned or box soup, pasta, cereal, and rice.